Upgrading the Royal Canal into a greenway in the Dublin City Council area should cost around €10 to €12 million, councillors were told earlier this week. The route is the most eastern section of the planned continuous Dublin to Galway greenway. The project will require Part 8 public consultation which is due to get underway and last 5 months. Details of the project and consultation would then be brought back to a local area committee and then a full meeting of city-wide councillors for final approval. 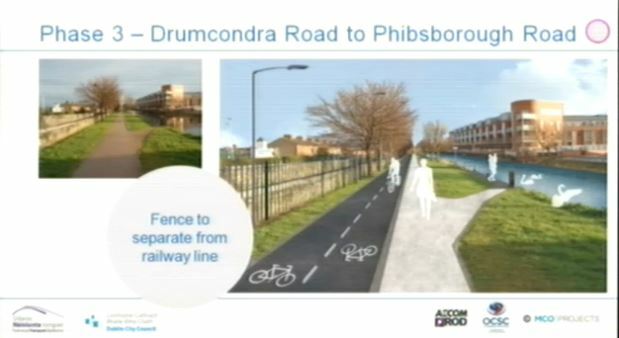 The route would include new or upgraded at-grade crossings of a number main roads which the canal travels under, including at North Strand Road, Drumcondra Road / Dorset Street, and Phibsborough Road / Prospect Road. There is no space for underpasses at these locations. 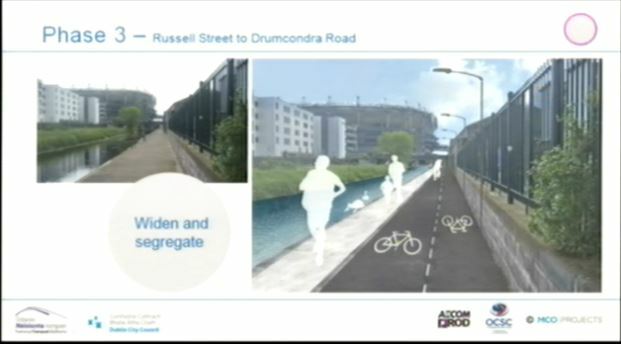 According to a presentation made to councillors, most of the path would be shared use — with a fully shared surface or a shared surface only separated by a white painted line. 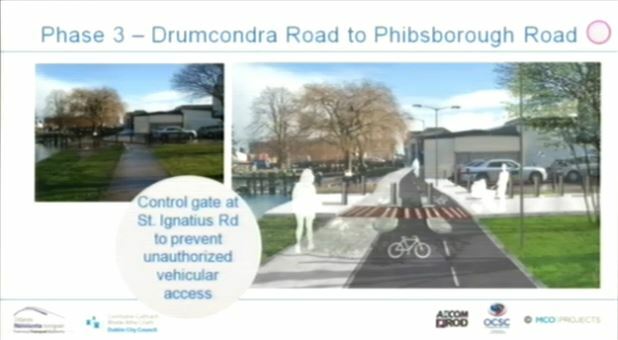 Christopher Manzira, of the transport section of Dublin City Council, told councillors the route would include public lighting, CCTV, and the removal of kissing gates. 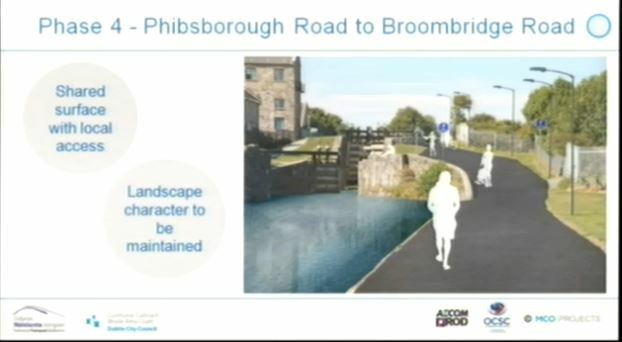 He said only bollards would be use to allow for universal access for intended users and to make the route attractive to commuter cycling. 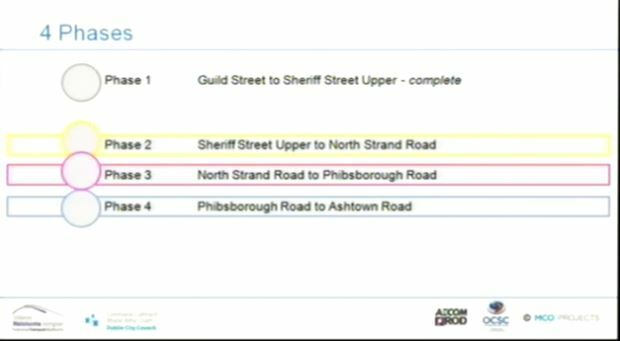 Full details of the route, including project drawings, are due to be soon uploaded to a revamped Dublin City Council cycling website, CycleDublin.ie. At the time of writing it has yet to be updated, but Manzira said files for the Liffey Cycle Route should be online by today, followed by documents for the canal route. 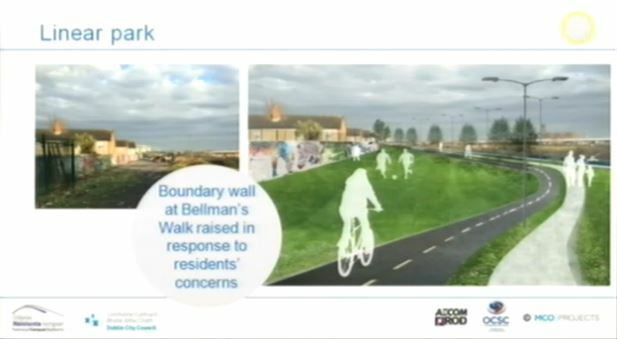 Paths will be widened, however, answering questions from councillors Manzira said joggers may have to impede on the cycle path at some sections to overtake people walking. NOTE: Some of the slides make the paths look narrower than they possibly are, please refer to public consultation drawings when released. I applaud the idea. However, I think that in some of the images I’ve googled of the proposed development, the cycle path looks badly designed. A bicycle path doesn’t need to be big enough to drive a city bus down. That seems pointless and wasteful. It doesn’t need to be 2.5 or 3 meters wide at any point. That is ugly, and wasteful of materials. It would be better to make a well constructed cycle path of perhaps 1.2 meters for both cycle lanes, with a very good level surface, (clearly delineated and slightly raised wherever it encounters traffic, with a beveled, rounded kerb edge, to facilitate bicycle access). I recommend that the relevant ministers should take fact finding cycling holidays in the Netherlands. It will save the tax payer money, and work better in the long term if it’s done properly. @ Aengus — if they went on a fact finding cycling holiday to the Netherlands they’d quickly be told that 3 metres should be seen as a minimum (expect for pinch points). 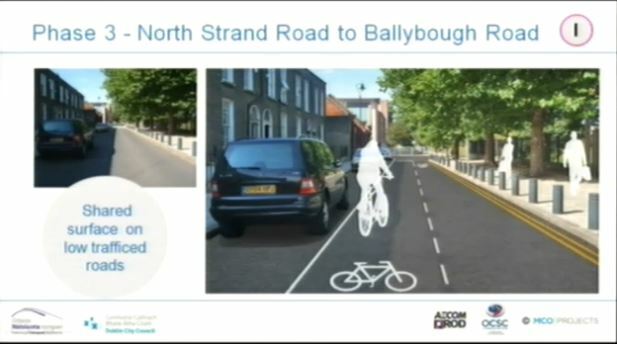 And that 4 metres is closer to optimal for the cycleway section and 4 metres would not look out of place on many sections (ie near Ashtown and between North Strand Road and the Docklands). Nobody is suggesting concreting over everything. It will save the tax payer money and be better in the long term if it’s done properly now and that the cycleway widths are as close to 3 metres or 4 metres where appropriate. I use this route some times for leisure rides and there are conflict areas with Pedestrians and other Cyclists, some of it is fairly narrow around 1 1/2 metres or 4 1/2 feet or less. So you really need that 3 metres or better still 4 metres for to allow for Cyclists Pedestrians with Dogs and Joggers not to fall into the Canal. I dont think you could ever go at top speed on any part of it during the day for fear of hitting someone only Pootling speed .You always have to look out for other Cyclists Pedestrians with long Dog Leads and their Dogs or Joggers. You just cannot trust Pedestrians not to get in your way, so the more space the better. 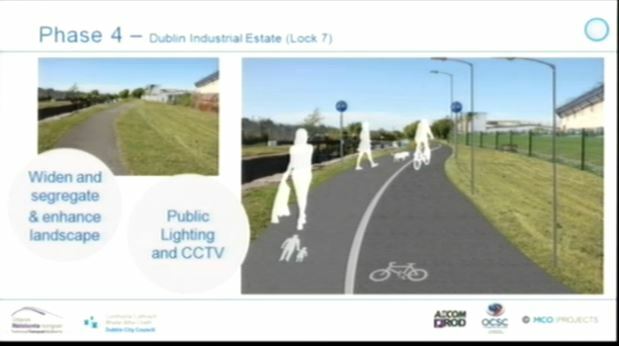 Royal Canal Greenway: How can a 7.5km cycle path cost over €10m?